We are truly proud of our references. Contact us for a specific reference for the type of service you are interested in. We are located in Ängelholm but have references among small local, medium size regional as well as large global companies. To the right you can see some examples. We are proud to say that we have, right since our start in 2010, only had satisfied customers and we intend to keep it that way. All of them are therefore our best references. Full reference letters including contact details are available upon request. 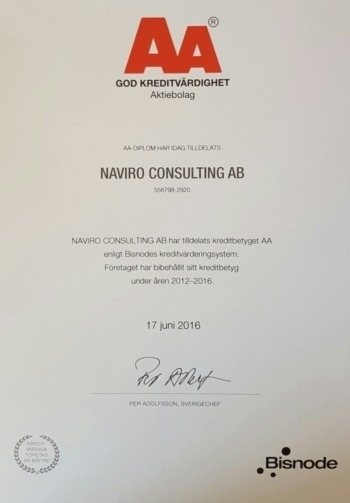 As another sign of being a trustworthy partner, Naviro holds a credit rating of AA, the highest grade available for a company being less than 10 years old. just a great person to know. he has a great business sense. business, and drive the many projects he initiated. business background and a good sense of humor. Bernt brings expertise and experience to the Board.